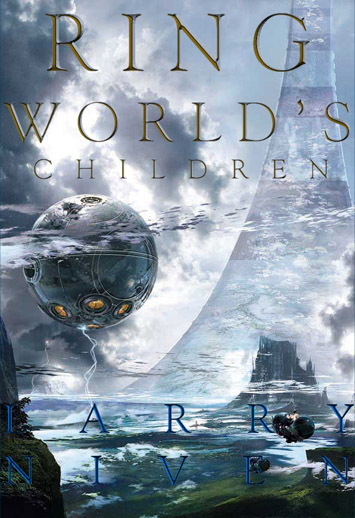 Ringworld’s Children is the fourth book in Larry Niven’s Ringworld series. The first book of the series released in 1970, won the Hugo and Nebula awards. Unlike some series, which can be read out of order, this series is best read in the order they were released (Ringworld, Ringworld Engineers, Ringworld Throne and the latest). In fact, many recommend reading the book Protector, which is part of Niven’s ‘Known Space’ series, before reading the Ringworld books. The main character of the books, Louise Wu, made his debut to the Known Space series in the short story There is a Tide, but the background in that story isn’t overly relevant to the Ringworld books. After Ringworld was released, numerous fans, writers engineers, and others, wrote documents considering the implications of a structure like the Ringworld, and what life and societies on such a structure might be like. (The structure is a million mile wide ribbon, looped around a star, at a distance roughly the same as that which the Earth orbits our sun. The structure is spinning so the centrifugal effect give a feeling of ‘gravity’ to the inner side, which has millions of times the surface are of the Earth.) Niven has used and acknowledged many of these people’s ideas in the sequels, including in Ringworld’s Children. While some stories seem to get lost in technical details, Niven tends to integrate the abundant technical details into the stories, without leaving the reader feeling like the dialogue and action have been precipitously stopped. In addition to Louise Wu, Ringworld’s Children deals with some of the other characters from previous books, while introducing some new ones as well. Plot elements introduced in previous books are expanded upon, while new plot elements are woven into the series. Much of the appeal of this book are the unexpected, or surprising turns the story takes, so discussing specific plot points might be inappropriate in a review. Suffice to say, if you enjoyed any or all of the previous Ringworld books, you will likely enjoy this book. If you, like me, found that the third book in the series, Ringworld Throne, was interesting, but not quite up to the high quality of the first two, then you will likely be happily surprised by this one. In my case, I finished Ringworld’s Children, then started reading it again. Originally published in Neo-opsis #5, 2005.